Mary Kathleen Gibson of Knoxville passed on to her eternal reward on Sunday, December 23, 2018. Mrs. Gibson was born in May of 1927 in St Paul Minnesota to Edward and Agnes Lavelle; Mary Kathleen was the eldest of their three children. Her parents and siblings, Ann and Jack preceded her in death. Mrs. Gibson attended St Marys College in Minnesota and St Ambrose College in Davenport, Iowa for her RN and BSN. While attending St Ambrose College she met, became engaged to, and shortly thereafter, married George D Gibson of Illinois. After several years of traveling around the world for the Foreign Service, Mr and Mrs. Gibson settled in Manassas Virginia with their four children. Mrs. Gibson was very active in her Manassas community and All Saints Catholic Church where she sang in the choir for over forty years. 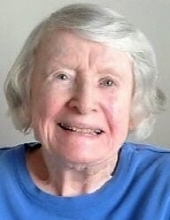 After her husband of fifty five years died in 2009, she moved to the retirement community at Shannondale in Knoxville, Tennessee in October of 2013 to be near her family. Mrs. Gibson is survived by her four children, Patrick (Cindy), Matthew (Robin), Athena and Colleen; 10 grandchildren; 12 great grandchildren; several nieces, nephews and cousins. The family will receive friends from 2 to 3:30 p.m. on Tuesday, January 1, 2019 at the Click Funeral Home Middlebrook Chapel with a Rosary to follow at 3:30 p.m. A Mass will be held on Wednesday, January 2nd at 10:30 a.m. at All Saints Catholic Church, 620 North Cedar Bluff Road, Knoxville, Tennessee. A reception will follow in the Parish Hall. Family and friends will gather at 12 noon on Friday, January 4th at Quantico National Cemetery in Triangle, Virginia for graveside services and interment. Click Funeral Home, 9020 Middlebrook Pike is serving the Gibson family. To send flowers or a remembrance gift to the family of Mary Kathleen Gibson, please visit our Tribute Store. "Email Address" would like to share the life celebration of Mary Kathleen Gibson. Click on the "link" to go to share a favorite memory or leave a condolence message for the family.